Cultivating a private university in a vibrant city, located in one of the fastest growing regions in the world, and during one of the most explosive periods in history, is exactly the role Jacksonville University President Tim Cost envisioned from the beginning. And he doesn’t intend to back down from that. Instead, he fully expects the University community to lean in with an energy that matches his own. 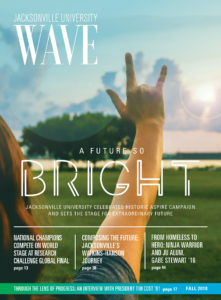 As the University celebrates the unprecedented success of its ASPIRE campaign, President Cost sat down with WAVE to talk about his first five years as President, and to take a look at what’s coming for Jacksonville University in the next decade. Q: With so many improvements and investments defining your tenure, how would you describe Jacksonville University today? A: This is what could be considered a turn-around start-up, and when you’ve got an 84-year old institution with so much promise, that’s a thrilling venture. We believe in innovation that leads to growth, not status quo. We don’t shoot down great ideas from talented leaders. We’re always asking, “Where will the world take these students next?” Then, we work to market-back. Q: As President, how do you approach decisions concerning the University’s trajectory? A: Our leadership regularly talks about how a 14-year-old today will prefer to live and study five years down the road, when that student is a sophomore on this campus. In my first weeks as president, we met with students, in small and large groups, and said, “Tell us about your lifestyle. How do you learn best? Where are you from? What do you want to do next?” And the more they shared, the more we identified key points for our decision making. Then we poured capital improvements into this campus. We started new majors, minors and degrees. We provided access to everything from drones to simulation labs. We embarked on a comprehensive strategy of partnerships, dozens of them. We decided that our University would be a partnership-driven, economically based, liberal arts informed and student-centric institution. Q: What’s your take on how to foster pre-enrollment affinity with prospective students? A: If you assess cohorts across this campus, there are several groups that do this well. These students step onto campus already connected, already feeling a part of our DNA. Let’s take student-athletes as an example. This group, like many others, exhibits those core qualities we most care about: thriving, serving, graduating, giving back and building meaningful, rewarding careers. Quick story. Several years ago in a Board of Trustees presentation, I shared some data—diversity, retention rates, graduation rates, GPAs and so on. Before I could identify the cohort, the Board emphatically said, “We want more just like them.” That cohort numbered roughly 500 students. They are your Jacksonville University NCAA Division I athletes. Like other natural cohorts—Greek organizations, Honors students, NROTC, Keigwin School of Nursing, international, etc.—they are standouts. Our student-athletes are excelling in the classroom and on the field. Artis Gilmore, Daniel Murphy, Russell Knox—these alumni are a part of our legacy of excellence. Regardless of the cohort, we continue recruiting the best and brightest. That JU brand of DNA is already present. Q: We’ve heard you refer to the University becoming a premier institution. What does that entail? Is there a microcosm on campus that demonstrates this? A: One direct way to explain what we mean when we say that this University is becoming a premier institution is to talk about the Brooks Rehabilitation College of Healthcare Sciences. It has proven to be a best practice model of what potential Jacksonville University holds. We hot-housed the concept of this University’s future, including the breakthrough moment creating a School of Applied Health Sciences. Kinesiology, occupational therapy, speech pathology, mental health counseling, data analytics and health informatics, and more to come. This process began with us sitting down with Brooks Rehabilitation, Florida Blue, the Mayo Clinic, Baptist Health, and others to talk collectively about where the market is going. We aimed, in five years, to establish Jacksonville University as the premier health educator in the region. And there’s no question that we’ve accomplished that. No one else in the state of Florida has returned NCLEX scores for five consecutive quarters with a one hundred percent pass rate. No one else has 400 healthcare industry partners. Our Brooks Rehabilitation College of Healthcare Sciences, under the leadership of Provost Dr. Christine Sapienza and her hugely talented team, sets the bar high, and the beneficiaries of all this progress are students. As Brooks continues to progress, expand and improve, so does the entire University. Q: Terms like “silos” and “ivory tower” are often attached to higher education. What’s your philosophy for how to avoid these pitfalls and create greater interconnectivity? A: During my corporate career, I thought higher education leaders had become accustomed to silos, which I believe rob an organization of its natural agility, creativity, speed and resiliency. This type of mindset simply isn’t conducive to strategic partnerships and excellence. Here, we were intentional about creating a mosaic of partnerships. Whenever we explored the possibility of a new partnership, we first asked what the University could offer them, our partners. It’s not about us going out to ask for XYZ, but genuinely seeking how this University can help others. This quote gets repeated a lot around here, including by me: “Don’t think less of yourself, think of yourself less.” That’s the goal, and the sharpest tool we have to accomplish that is through partnerships and talented people. Q: Academically speaking, what can we expect to see happening next across the University’s six Colleges and Institutes? A: You’ll see this University step hard into some of our global market’s most interesting and innovative fields, many of which we’re already teaching—engineering, robotics, the marine sciences, cybersecurity, sustainability, speech pathology, public policy, and others. In a far more targeted and precise way, we will continue evaluating what we teach, how we teach, where we invest, what type of students we attract and what jobs they may secure after graduation … all with a liberal arts and sciences base. Q: Higher education channels seem locked in an endless debate over the value of liberal arts. What are your thoughts? A: Jacksonville University embraces the liberal arts and sciences. The core concepts of critical thinking, communication, rational reasoning … these don’t go in and out of style. Today, there may be some negative connotations attached to the label “liberal arts.” Still, I believe you’ll see a full pendulum swing, across the higher education landscape, from a solely STEM-driven focus to a more holistic approach. With more and more data around the 360-degree education of students age 18 to 25, we will also continue prioritizing the development of valuable skills in a definitive field of their choice. But we believe that our liberal arts and sciences underpinnings mean greater agility for graduates. After all, employers are looking for well-rounded team players. Q: What would you say to someone who’s considering getting involved with the University? A: When we first started getting out the message about all the exciting things happening here, our alumni base grew more interested and engagement increased. That was exciting and provided us momentum. Now, we constantly explore opportunities to further activate the Jacksonville University ‘nation,’ to more deeply involve alumni, faculty, staff, students, donors, business partners, sports fans, community partners and anyone else who walks onto our 240 acres. Q: Strictly talking numbers, which data do you find the most meaningful expression of the University’s recent accomplishments? A: First, recruitment and retention rates are key. Most folks don’t realize that we have welcomed more than 10,000 visitors and prospective students to campus over the past 12 months. We’ve also moved the needle on retention rates. In our first year together, that increase equaled more than 20 percent. That’s real progress. Second, when a university flexes its economic muscle, that’s impactful. We’re already more than $400 million into a community revitalization process that will radiate out from our front gates into the Arlington community, a mile in every direction, possibly more. Think of a collegiate village, and know that Jacksonville University counts it a privilege to be the nexus point of such a transformation. Last, and so important to where we’re headed next, the University recently completed the $120 million ASPIRE Campaign. ASPIRE provided more than funding for new facilities, upgrades and programming. It gave this University confidence. Likewise, our recent bond offering also demonstrated that, for this University, you can’t reach too high. An astounding $1.82 billion in bond orders for $150 million plan, 12 times the expected offering, is an exciting glimpse into what the future will bring. Q: As you step into your sixth year as President and wrap up the ASPIRE Campaign, what do you most want on the collective mind of the Jacksonville University Community? A: We’re just getting started. It has been five years, and we’re ready for our next chapter together as an institution. Let’s get ready to deliver several more wins for this University in terms of progress. Let us also remember that Jacksonville University is a growing, living, breathing institution. When we invest in it, nurture it, and spend our time here, this University will grow in ways none of us could have imagined. Together, we have changed the slope of progress.